Researchers have designed and created a prototype for a new solar cell that incorporates many cells stacked into a single device capable of trapping almost all of the energy in the solar spectrum. The new design transforms direct sunlight to electricity with 44.5% efficiency, offering it the potential to become the world’s most efficient solar cell. The method is different from the solar panels one might typically see in fields or on rooftops. The new device uses concentrator photovoltaic (CPV) panels that employ lenses to concentrate sunlight onto minute, micro-scale solar cells. Due to their small size - less than one millimeter square - solar cells utilizing more refined materials can be developed in a cost-effective manner. The stacked cell serves almost as a sieve for sunlight, with the specialized materials in each layer taking in the energy of a particular set of wavelengths. By the time the light is funneled via the stack, a little less than half of the available energy has been transformed into electricity. By comparison, the most common solar cell now converts just a quarter of the existing energy into electricity. Around 99 percent of the power contained in direct sunlight reaching the surface of Earth falls between wavelengths of 250 nm and 2500 nm, but conventional materials for high-efficiency multi-junction solar cells cannot capture this entire spectral range. Our new device is able to unlock the energy stored in the long-wavelength photons, which are lost in conventional solar cells, and therefore provides a pathway to realizing the ultimate multi-junction solar cell. While Researchers have strived towards achieving more efficient solar cells for years, this method has two novel aspects. First, it uses a group of materials based on gallium antimonide (GaSb) substrates, which are typically found in applications for infra-red lasers and photodetectors. 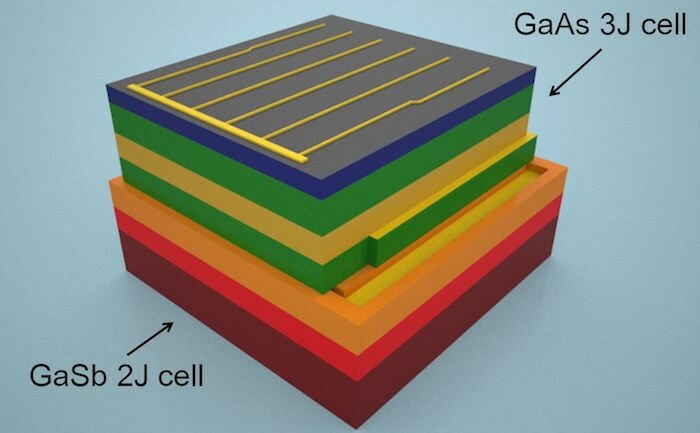 The novel GaSb-based solar cells are assembled into a stacked structure together with high efficiency solar cells grown on conventional substrates that trap shorter wavelength solar photons. Furthermore, the stacking process uses a method known as transfer-printing, which enables 3D assembly of these minute devices with a great degree of precision. This particular solar cell is costly, however the team believes it was vital to exhibit the upper limit of what is possible in terms of effectiveness. Despite the present costs of the materials involved, the method used to develop the cells displays much promise. Ultimately, a similar product may be introduced into the market, enabled by cost reductions from extremely high solar concentration levels and technology to recycle the costly growth substrates. The research expands on the progress made by the MOSAIC Program, a $24 million research project funded by the Advanced Research Projects Agency-Energy (ARPA-E) that funds 11 different teams throughout the U.S., each seeking to create technologies and concepts to transform photovoltaic performance and decrease costs. The Researchers highlight that funding for this type of research is vital for developing feasible commercial technology in the future. The research paper titled, “GaSb-based Solar Cells for Full Solar Spectrum Energy Harvesting,” was published in Advanced Energy Materials on the 10th July 2017. For industrial development some critical factors are needed. 1) What is the projected price per watt of the cells? 2) What is the projected watts per pannel assuming the same size as a current 50 Watt panel? 3) Will cooling technology be needed to sustain it? 4) How are these devices protected from inclimate weather like blowing dust or hail?